or torque figures, expect the Bolt’s mill to be fairly comparable to the Hog’s in terms of output. The engine is mated to a 5-speed transmission with straight cut gear dogs, and final drive is offered via a 21mm wide carbon fibre reinforced belt. A 3.2 gallon fuel tank promises roughly 150 miles of range—more or less the same as you’ll get from the Sporty’s 3.3 gallon tank. Like Harley-Davidson and Honda—both which have a lot of momentum right now—Yamaha understands that fresh, stylish and affordable motorcycles are key to resurrecting sales. But rather than building a classic-styled bike, Yamaha opted to build something with a “younger character,” to borrow the words of Star’s Product Manager Derek Brooks. 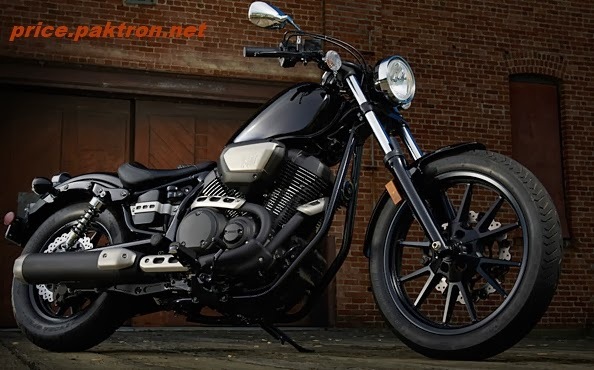 Clearly, the Bolt’s styling is a mix of old-school bobber and modern. The 3.2-gallon tear-drop tank has subtle badges, the front and bobbed rear fenders are made of steel, and contemporary touches include an LED tail-light in a classically styled housing, and an LCD speedometer beneath a smoked lens. The two-into-one exhaust features black headers, but with heat shields and muffler done in contrasting aluminium. Gold-anodized shocks with piggyback remote reservoirs distinguish.